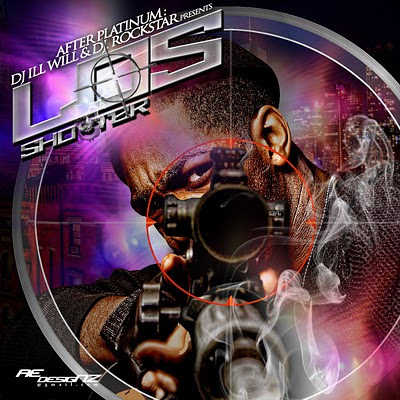 It's been a long time, almost 4 years, since I interviewed Los for the City Paper, and back then his talent was really undeniable, but he really didn't have much music out at all at that time. 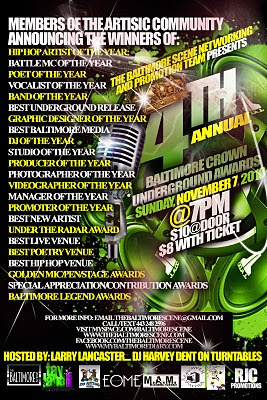 So it's been nice over the past couple years to see him really step up on the mixtape circuit and drop music consistently, to the point that it seemed right to give him a Best of Baltimore award this year. I was especially looking forward to Shooter because as great as he can be on other people's beats, it was exciting to finally get a full project of all original production. I wouldn't say this is a front to back classic, there's a few songs that get on my nerves, but for the most part this lives up to my expectations, just a solid tape. It's got the track with Midas that I posted a while back, production and cover art by Skarr Akbar, and a lot of big features like Raheem DeVaughn, Rick Ross and Cory Gunz. I love when rappers treat intros as a chance to just start the record on a good tip and rap their asses off, and that's totally what this is, produced by 21. Here’s Wordsmith’s video for “Show Me The Money” and “Touch Backdown,” two songs off his new ‘EPixtape’ (ugh really? that's what we're calling these things now? ), Buzz Bangers Vol. 1. Recently I was going through some old magazines I’d had stuff published in, and found the late 2006 issue of Mic Life Magazine in which I had an article on Jade Fox. That was the first time I met her and heard an advance version of her album, Ashes Of Another Life, which was eventually released in 2007. 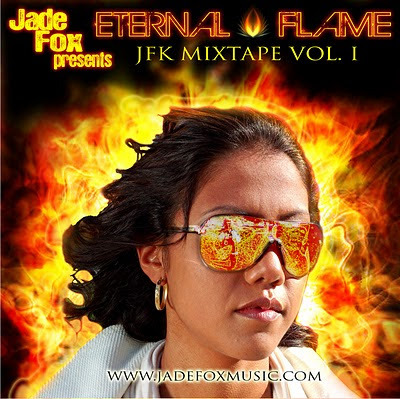 And it just kinda blew my mind to realize that was 4 years ago, because Jade Fox has stayed pretty active since then, playing a lot of shows and keeping up her presence online and occasionally leaking new tracks, but this new record she just released is her first new full-length project in all that time. It's got mostly original production, but it definitely has a mixtape feel in the sense that it's longer and has a lot of guests, including Kane Mayfield, the Unstoppable Nuklehidz and Chyna Doll. I do miss the cohesive feel of Ashes, which had no guest rappers and pretty much the same production team for the whole album, but hopefully it won't take another 4 years for her to drop another proper album. 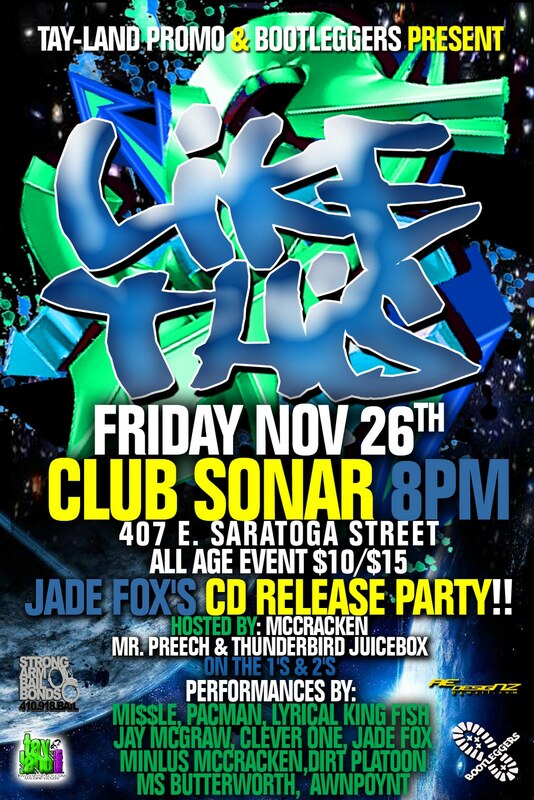 Jade Fox's release party for the mixtape is this Friday at Sonar. This track features a sample of Jeff Buckley’s “Dream Brother” and is produced by Tytanium, who produced another track on the album that samples Bjork, so I’m guessing Tytanium was an angsty teenager in the ‘90s (as was I, which is why I recognize the samples). Scholarman is dropping a new album called ExiSTANCE in January, and this is the video for the first single "Lyrical Baptism." 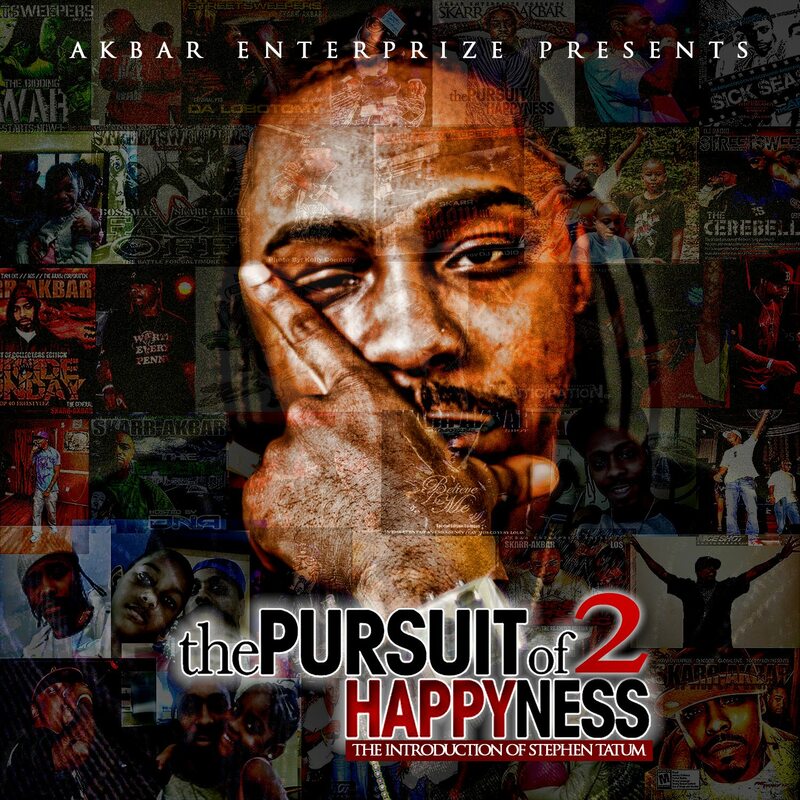 This is a classic example of why I get frustrated with the laziness of mixtape titles -- Skarr Akbar is one of the most tirelessly creative rappers and producer in Baltimore, but when it came to put a name on one of his best mixtape albums earlier this year, he just nicked the title from a random Will Smith movie. And since it turned out to be pretty popular, now he’s made a sequel, which means that one of Skarr’s most anticipated projects to date is dropping with a generic title like Pursuit of Happyness 2 that just makes it sound like a random workaday mixtape. Then you add the subtitle The Introduction of Stephen Tatum, which doesn't even make sense with a sequel, and man, that's just terrible. The music on the CD itself is good, I'm just saying, dude shouldn't have a song called "Amazing Imagination" and then come with such an unimaginative album title. In any event, this is a solid follow-up to the first Pursuit of Happyness, lot of good original beats by Skarr and others, really some of his most emotional and honest music to date. I think dude is realizing that people respond to those times when he really vents about his personal life and kinda lets you into his head, so he's really letting it all out here. I like that some of the tracks are only 2-3 minutes long but still feel like complete songs, Skarr doesn't overdo it and make them any longer than they need to be, you get 15 songs in under an hour, which is pretty economical by rap standards. 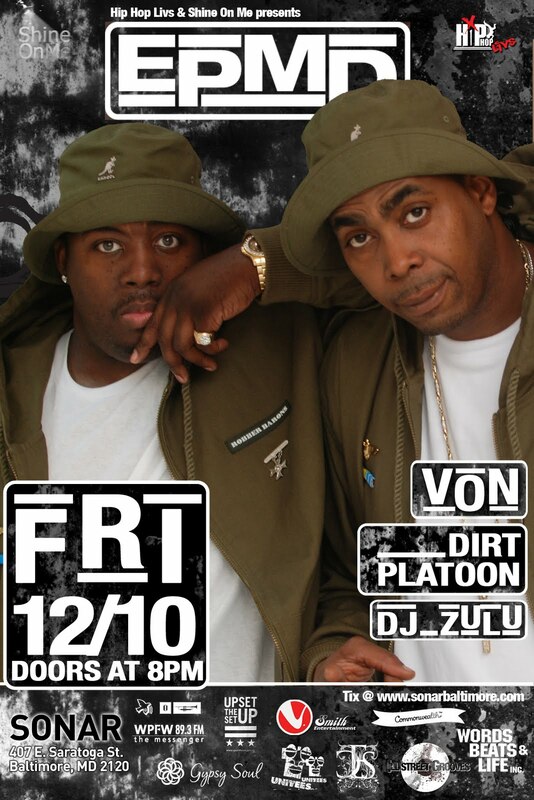 There are guest spots by Jahiti of Brown F.I.S.H., Smash and 100 Grandman, and you can download it at AllBmoreHipHop.com. This is one of my favorite songs on the record, although it presents some disturbing evidence that Skarr might be catching the "what else" syndrome from Comp. In the last few months since Mania Music Group dropped their first official album, Welcome To The Audience, the crew's been back to work on the first round of full-length solo albums from the label's four MCs, and it's looking like in 2011 Kane's coming with his album first, with Midas up next with his album American Graffiti. Kane's lead single is actually one of his solo cuts from Welcome To The Audience that I guess he wants more people to hear or take a second look at, and Midas just recently leaked out his first new song, "Jump," which is real high energy and vaguely familiar, I think he might've performed it last time I saw Mania live. I was very interested to hear about this project, basically an all-star instrumental mixtape full of beats from some of Baltimore's best rap producers, because it's just kind of unprecedented in this scene. Obviously producers are always passing around CDs of beats looking to work with MCs, but other than a couple instrumental albums I've gotten from Ron Rico and Me'Aze Millioni they don't seem very commonplace, certainly not a compilation full of beats by different producers like Imahj put together for different projects. 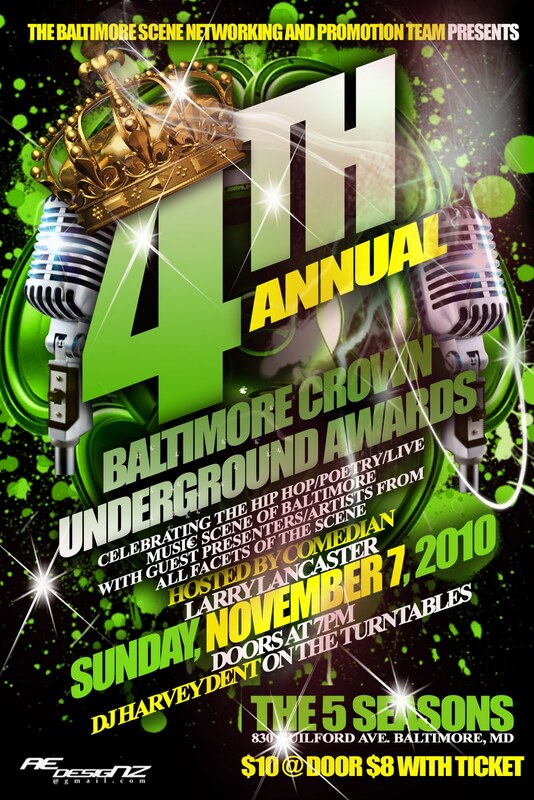 As the host, Ambush, says on teh intro, “we bringin’ beat tapes back.” There's some unfamiliar names on here as well as some producers you've probably heard of like Banga Bill, Ms. Tris Beats and Heist, as well as some rappers who produce a lot of their own stuff like Skarr Akbar, PenDragon, Sean Toure and Street Scott aka Street Heat. And everyone gave their tracks titles, so it's a little easier to visualize them as becoming songs or already being songs when they have evocative names like "Ice In My Veins" or "Devilish." The “you are now listening to the sounds of Baltimore Beat Bangers” tag all over every track gets a little annoying, but I understand if that’s the way producers gotta protect their tracks from getting jacked and used without getting paid for first. It'll be interesting to see how many of the beats on this CD get turned into songs by rappers in the next year or so. 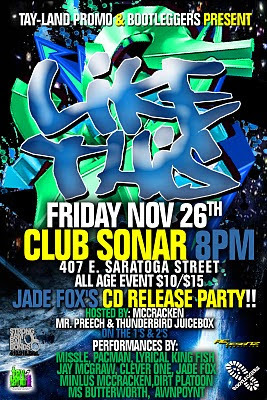 You can download Baltimore Beat Bangers at AllBmoreHipHop.com and the release party is at Club Reality this week. Ms. Tris is such a versatile producer, this one stood out to me as soon as I heard it but I wouldn’t have guessed it was her,has a very contemporary radio-friendly sound but still really detailed and unique. Here's "1st Hand," the latest video from Dirt Platoon's excellent new album on Brake Fast Records, Deeper Than Dirt. You probably remember Young Crip from Smash’s big single “Bit Too Much For Me” a couple years ago, but this is the first time I’ve heard a solo track from him, and it’s pretty dope, from the soundtrack of Diamond K’s upcoming movie Who Shot Ya. The track’s produced by Dukeyman, who’s always had a knack for taking a sample that you might not think would make a dope rap song and going hard with it. 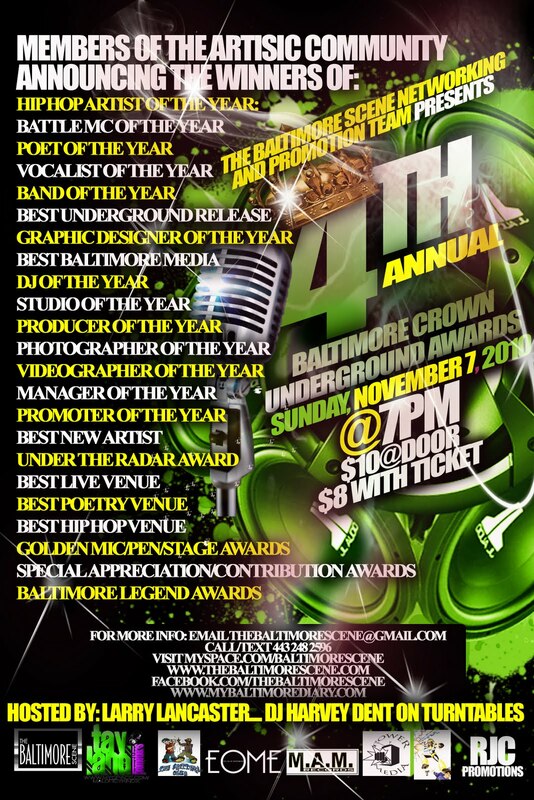 Last year Government Names was nominated for the Mobbies, the Baltimore Sun's local blog awards. I didn't win then, but I'm nominated again this year, which I feel a little weird about since I've actually done some freelance work for the Sun in the last few months, but I checked and apparently it's OK that I'm in the running. So vote for me between now and November 12th, if you want. Rome Cee might be the Baltimore rapper I first heard this year that I'm most excited about, so I was very happy to hear that he's got a new album called Children Of Stars dropping in January. 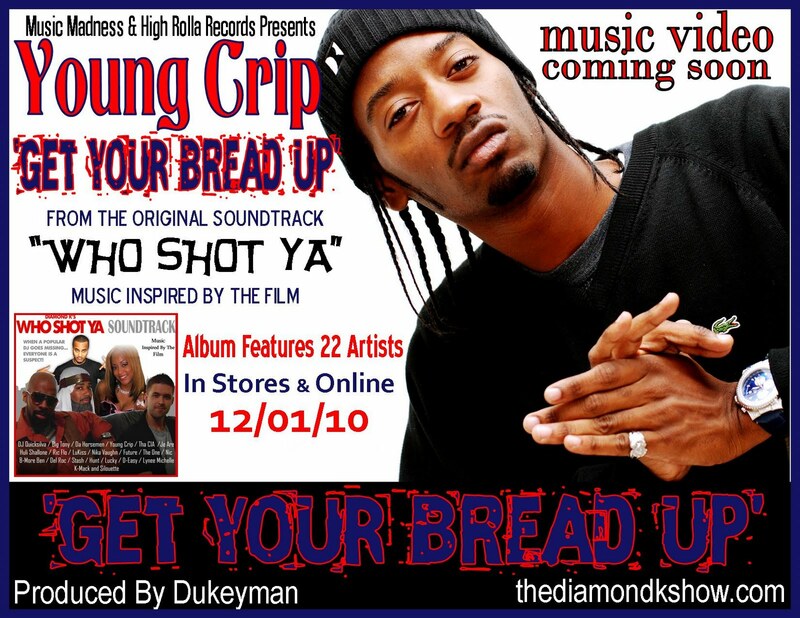 Here's one of the singles, produced by E-Hill. This is “Secret Lover” by P-Tactics. I’m not real into the song but the production values on the video, directed by Meech, are pretty impressive. 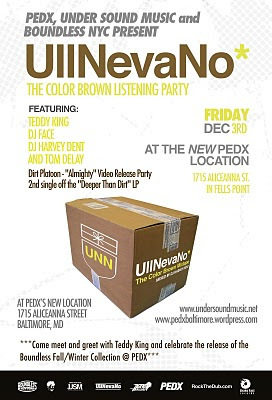 It's funny, obviously there are a lot of crews in Baltimore hip hop and a lot of collaborations happening, but I don't feel like people around here have really embraced the concept of duos and projects with 2 artists working together enough, that's always one of my favorite types of projects in rap. 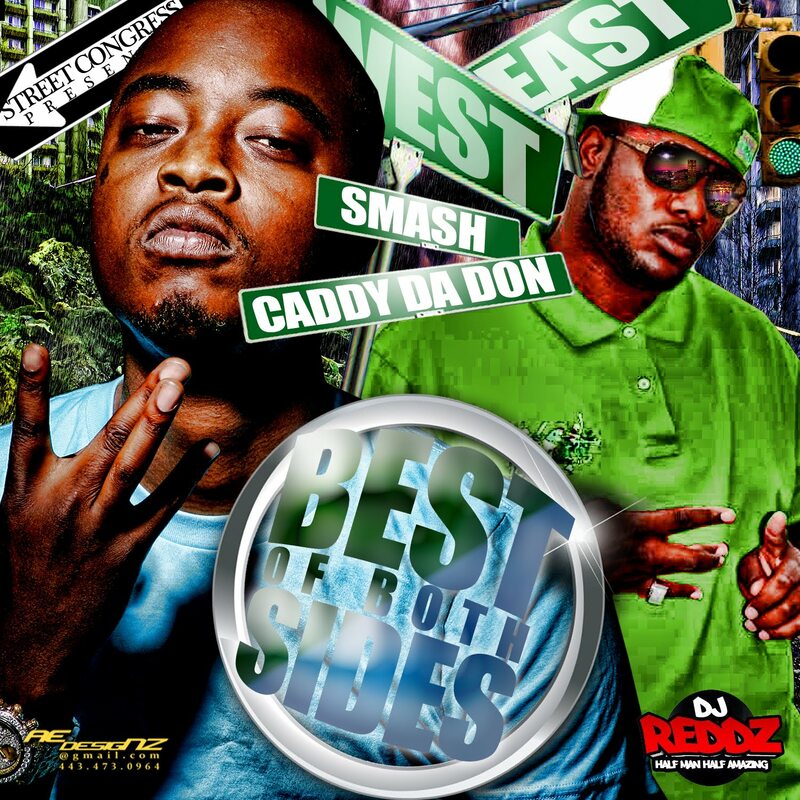 I think I particularly like this because Smash and Caddy Da Don are two artists that I have to admit I don't particularly love hearing a whole solo project from, they're alright but don't really hold my attention, but hearing them kinda work together on the same wavelength, they end up with something that's somehow more than the sum of its parts. They really went in and got some good producers on the project, too, with beats by D. Banks and E Watts and Spielberg, guest spots by Comp, cover art by Skarr Akbar, mixed by DJ Reddz. 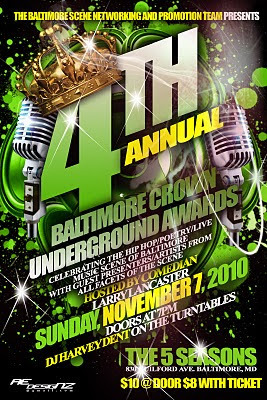 You can download it at AllBmoreHipHop.com. 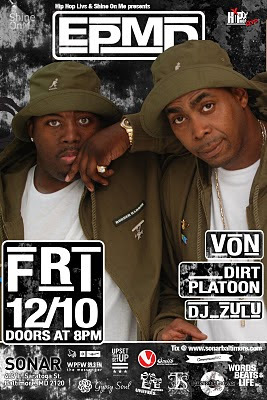 This track was produced by and features the rapper/producer formerly known as Street Heat, who runs with PenDragon's Team Arson crew and has done tracks for Dipset, and he recently changed his handle to Street Scott. That kinda freaks me out because one of my best friends in high school, really one of the people that got me heavy into hip hop, is named Scott Street.